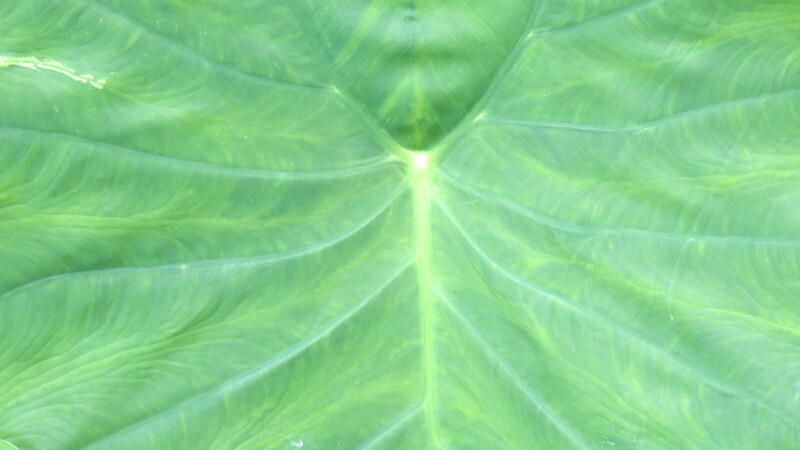 Elephant Ear Gives Birth — LIVE! 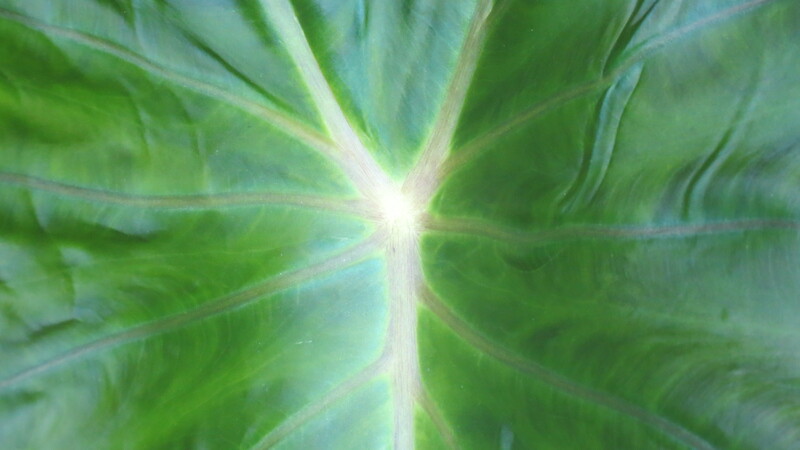 A close-up of one of one of the original Elephant Ears in the garden. This post has been a long time in the making – months, as a matter of fact. At the start of the growing season, I was strolling through one of the big box stores and found a corm for a red/purple/black leafed variety. I had seen this same plant in many of the seed catalogs – but in this store, the price was more than right. It was an elephant-sized bargain. Once the plant began to grow, however, the only thing true about the advertised color was the stems – strong and purplish black. 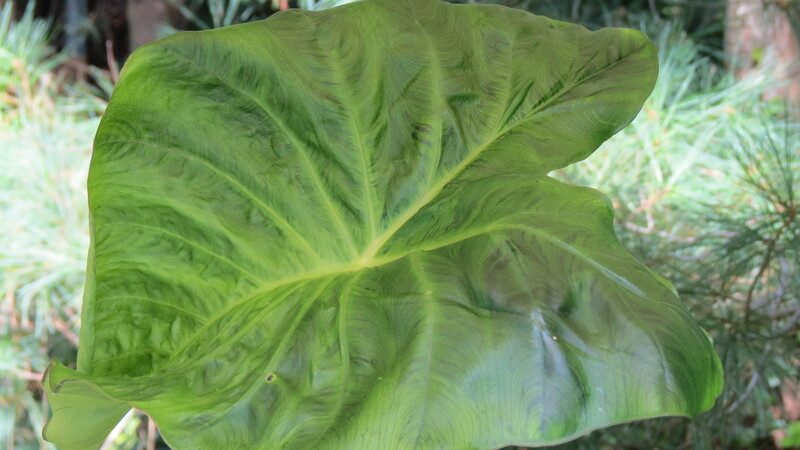 The leaves, on the other hand, were greener (and smaller, by the way) – not the same bright green as my other Elephant Ears, but green with hints of darker tones. In other words, they weren’t the red/purple/black on the packaging. A close-up of the new arrival. It may not be as green as the original, but it still has its charms. Although slightly disappointed with the result, I soon found myself drawn to my new plant, especially the glossiness of the leaves. They were so shiny, in fact, that they looked fake, as if they stepped right off of the Munchkinland set in The Wizard of Oz. 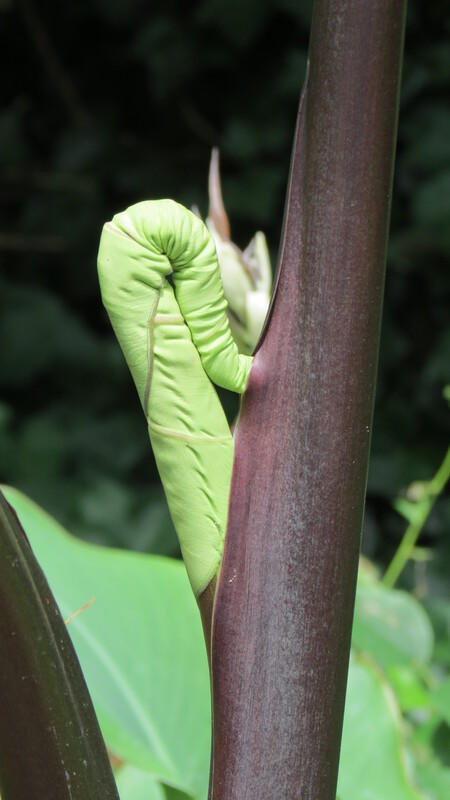 And then I witnessed the miracle of an Elephant Ear leaf birth – the agonizingly slow unfurling of a new leaf emerging from the purple/black stem. Over the next few weeks, I stood in the same spot to document the debut – like a proud papa tapping on the nursery window. 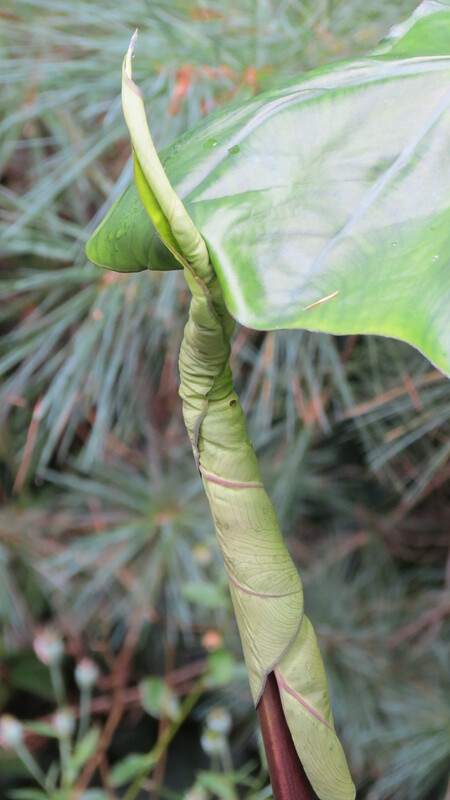 Weeks since it first emerged from the stem, the leaf is still stretching and growing to to its full size. Whoever said they grow so fast these days, never had an Elephant Ear. Hi Lori. Thanks — see you soon! Fabulous photography. 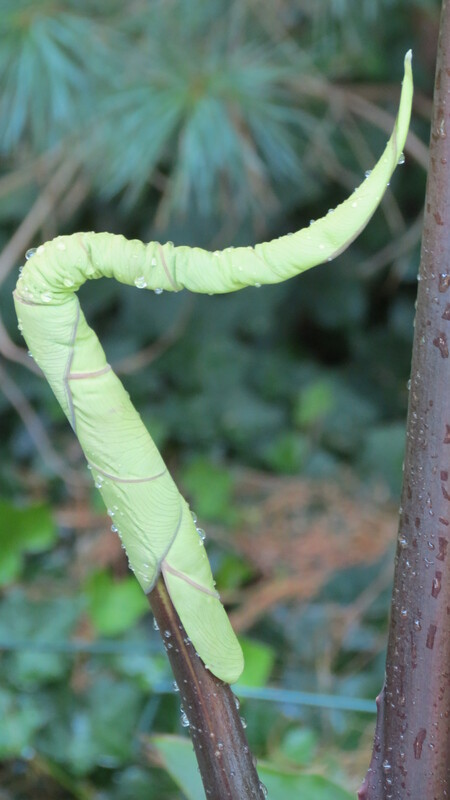 Amazing to think such a huge leaf can spring from such a slender stem with it’s own stem too! I was wondering when you said you’d said ‘Over the next few weeks, I stood in the same spot to document the debut’…such dedication! I guess I should clarify — I positioned myself in the same spot, took some photos, and then walked away. The last thing I want is to be mistaken for a garden statue. That’s a messy job. Now that most definitely is the miracle of birth… great pics. Great post. Amazing! Hi Carolyn. Yes, a definite miracle — so glad you enjoyed it. Be well. Very cool pictures. 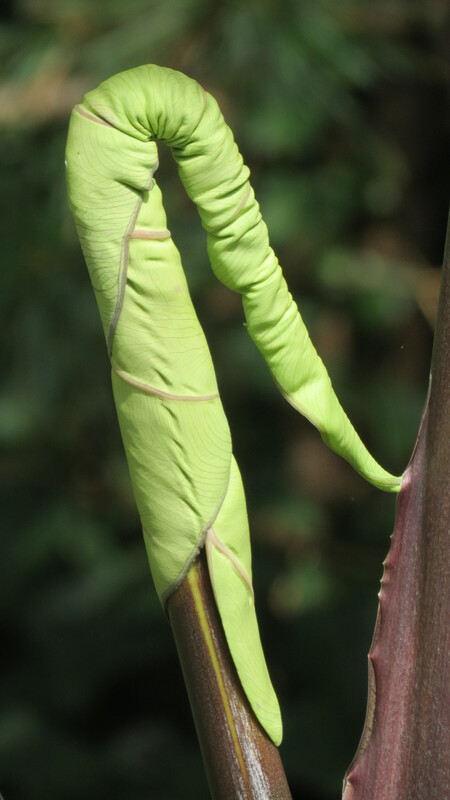 So an Elephant Ear look’s like an elephant trunk as it begins to unfurl. That was like time lapse photography, Kevin! Very interesting shots!! Fantastic, I love looking back at thow things grow! and wow what a beauty ! LOL. Never mind the mother elephant — I don’t think I would have had the stamina! How your post bighten my days, and even inspire me when I’m feeling done-in. Cheryl, you are too kind. Many thanks. Terrific photos. 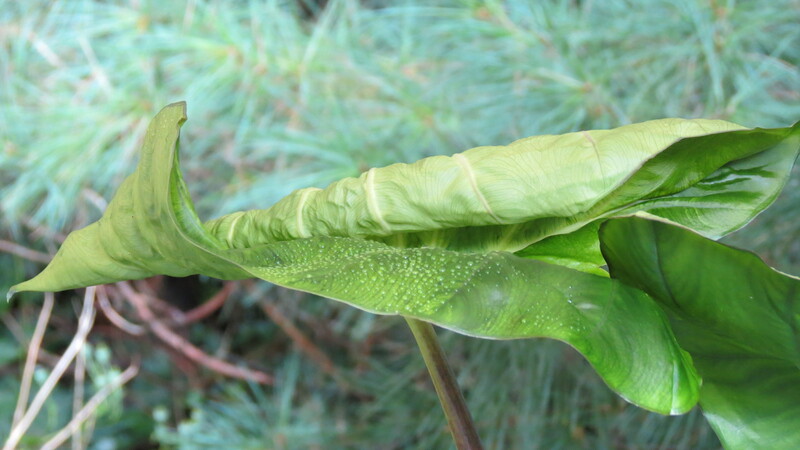 Jack in the pulpit gives birth to leaves in much the same way. Hi Mark. Glad you were able to stop by for a visit. It’s a very cool process to watch. Love it! It was such a cute little baby! Almost all grown up now! Hi Diane. Glad you enjoyed it. Congratulations on the new arrival 🙂 Amazing that it took weeks to unfold! Great photos and such great colours, even if they were not what you expected. Sometimes that is the beauty of gardening, getting a surprise! Hi Helene. Thanks. 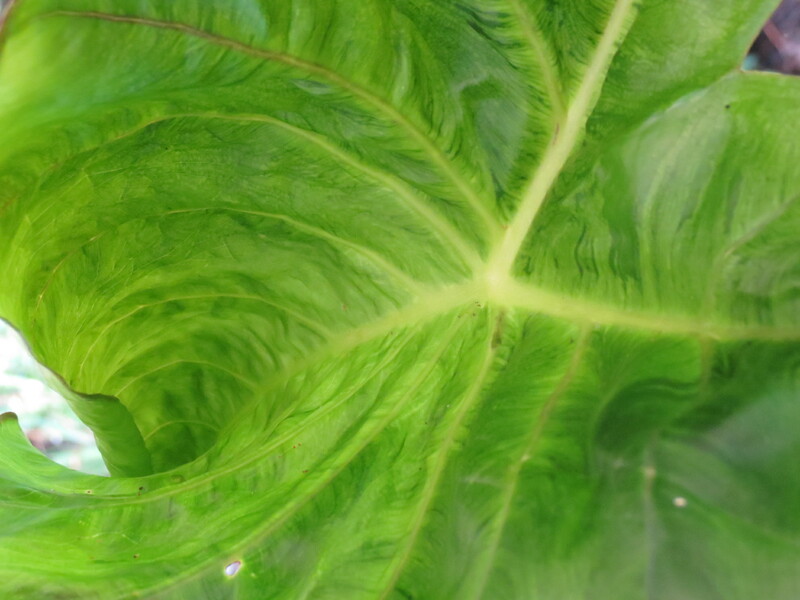 The bouncing baby leaf certainly has its strong points — and, yes, it was a pleasant surprise. Great photos. Despite the different colour this is one pretty plant. 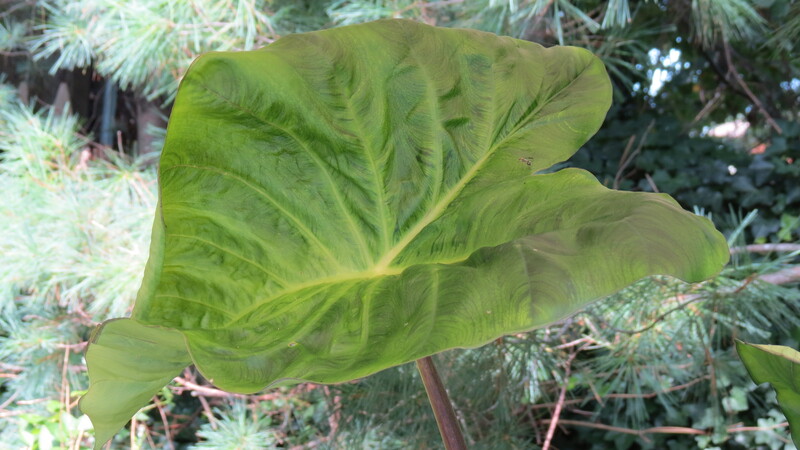 I like the dark veining in those leaves. Hi Marguerite. 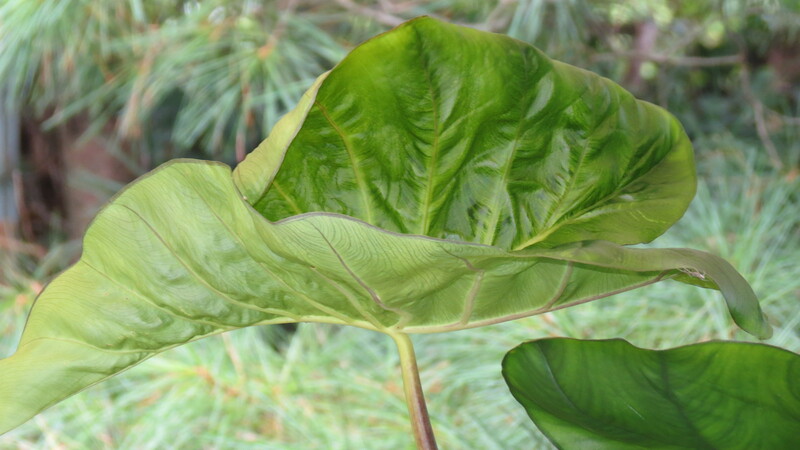 It is very pretty — and the leaves are attractive, especially against the darkness of stems. Up till now I haven’t liked Elephant Ears because they have not been very successful in my garden… BUT your blog and stunning photography has totally changed my mind. Thank you so much for posting this magical experience. No magazine, book or newspaper article would have been able to capture this ‘live birth’ the way that you were able. WOW! I do hope you give them another try. Just remember that they’re tropical and love heat, humidity, and water. 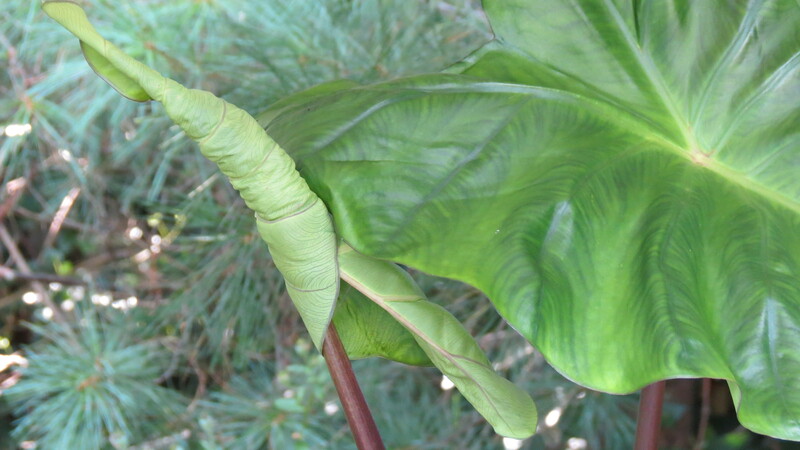 I’ve written about Elephant Ears in the past, including their planting and overwintering — feel free to explore. And many thanks for your kind words.